moviefan@filmraiser.com - or you will miss out on great movies! the internet thinks we're delicious...and will eat us! YOU WILL receive A CUSTOM LINK (VIA EMAIL) TO BUY TICKETS! When new movies are available as FilmRaisers we will send you a unique LINK—direct to Fandango (or Atom Tickets) that you can email, share and post. It will track any tickets your supporters buy through it! please be sure to whitelist all emails from FILMRAISER! 1) Add moviefan@filmraiser.com as a contact in your address book. 2) If you're a Gmail user, or you use another web-based email that filters "promotions" away from your main inbox, be sure to "drag" any emails from us into your Primary Inbox. This will ensure that you don't miss a thing. 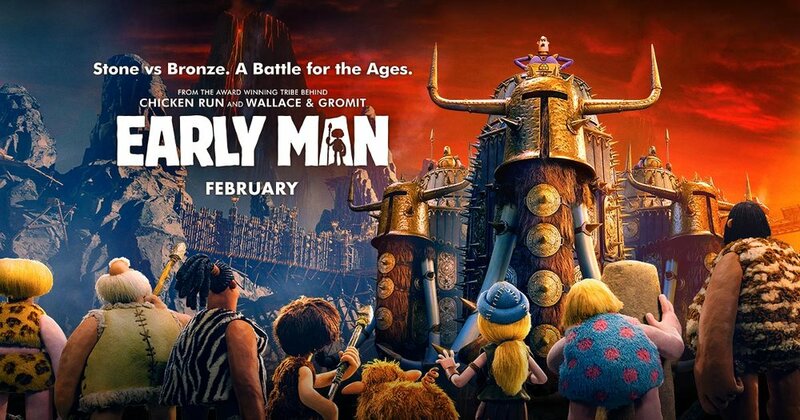 Let people know EARLY MAN will be a fundraiser for your cause. Just like you would for a birthday party—then reach people directly—by phone, email, and in person. It’s the BEST METHOD we have seen. Guarantees a great turnout. $1.00 FROM EVERY OPENING WEEKEND MOVIE TICKET—BENEFITS YOUR CAUSE—WHEN PEOPLE USE YOUR LINK TO PURCHASE TICKETS. Invite friends in other cities. ANYONE IN THE U.S. can select you! MAKE A GUEST LIST and reach people directly. SHARE your tickets link with everyone—and beyond. CICK through to Fandango. All tickets bought will track to your cause. WANT TO KNOW HOW YOU'RE DOING? HOW DID YOU GET PAID? After the event we will ask for your current mailing address so that we can send you a check! We have a unique opportunity to raise funds for [INSERT NAME OF CAUSE]—as Lionsgate and the movie EARLY MAN are donating $1.00 per movie ticket to our cause. Please help us by spreading the word to see the film opening weekend (February 16-18) - or anytime before April 1st. Tickets are on sale now! For sales to count: Get tickets using this Fandango link to support us: [COPY & INSERT YOUR UNIQUE LINK] — Thank you! FilmRaiser welcomes schools, clubs and causes—and many wonderful organizations, both national and local. Including community sports teams, churches, youth programs, non-profits, social groups and fundraising projects. (You do not need 501c3 charity status). THE PROGRAM IS FREE to organize. And movie tickets are face value. FilmRaiser works at ANY MOVIE THEATER where tickets can be bought on Fandango or Atom Tickets - depending on which ticket platform is our partner for the event. When the promotion ends (after opening weekend or when the film comes out of theaters)—we tally the box office sales and mail a check to you. The opportunity works all day, for every screening. PLUS—your community can promote the event to relatives and friends ALL OVER THE COUNTRY—anywhere in the U.S. where someone selects your cause our website before buying tickets to see the movie—money comes back to your cause! WHEN EACH NEW FILM IS ANNOUNCED—FILMRAISER WILL INVITE YOUr cause to PARTICIPATE! LET'S SEE GREAT FILMS TOGETHER! We will notify you every month or so when new movies become available as fundraisers. Studios decide which films are chosen...but we aim to give you several weeks to prepare. Participate as often as you like! Just click “Participate” in the emails we send to you. You can select the movies that fit your community—and skip others. We'll email to invite you to PARTICIPATE in a new movie. Click YES. We'll email you a custom link to buy tickets. Any tickets to the movie bought through that link track back to your cause! Some events checkout on Fandango and some checkout out on Atom Tickets—we'll announce with each movie! We'll often send you some great studio art (digital posters). And we'll show you how to easily add the name of your cause to the poster. Hopefully some of this helps! Find us anytime with questions. Do FANDANGO OR ATOM TICKETS work in your city? Enter your city on FANDANGO or ATOM TICKETS to see if theaters in your area are supported. These platforms works almost everywhere in the U.S. Our sincere apologies if your community is not supported yet.